I’ve had this old Matchbox 1/700 Fletcher destroyer model for at least 25 years. I had built it partway down to the detail parts and left it, as shown in the picture to the right (no U.S. flag). Last weekend I decided that I wanted to take on a small project, and rebuilding it with aftermarket parts and the correct camouflage colors seemed like a good idea. It ended up taking three days, not the anticipated two, but I finished it this morning, as shown on the left (finished model has a US flag). The inspiration for the rebuild was Eric Hammel’s Guadalcanal: Decision at Sea, which I finished over the weekend. The Fletcher was the last ship in the line at the naval battle off Guadalcanal on the night of November 13, 1942, and the book really got me interested in the different fire control systems on the ship. Unlike almost all the rest of the U.S. Navy ships that were there that night, Fletcher as a new ship (and first of her class) had a full suite of radars, including SC, the brand-new SG, and radar fire control. First step was to take the ship apart as far as it would go, including discarding the kit turrets and torpedo mounts. I then shot the whole model, including the Skywave USN equipment parts I knew I’d need, with Ocean Gray (5-O), which is the middle color in the Measure 12 Mod. 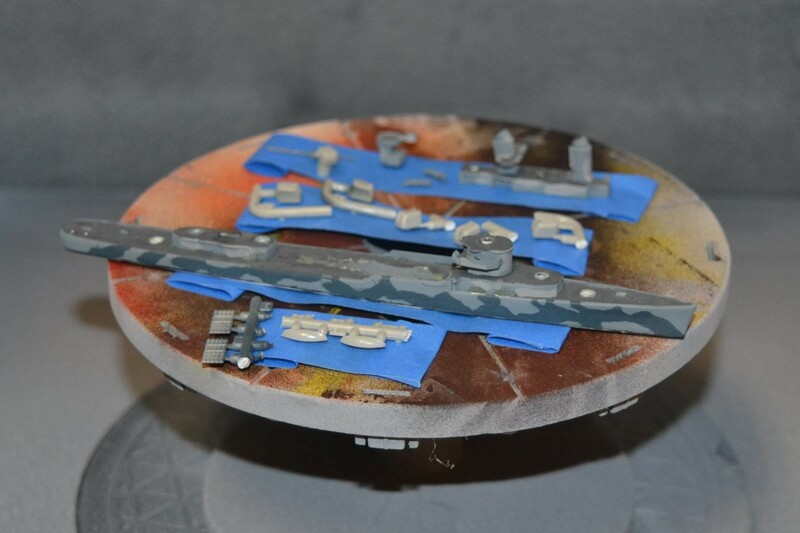 camouflage scheme, then handpainted the Deck Blue color for the decks. I reassembled the kit using new 5″ .38 cal. Mk 30 gun houses with separate barrels with blast bags, as well as new rafts, lifeboats, searchlights, torpedo mounts and Mk 37 gun director from the Skywave parts kit.I hadn’t planned on scratchbuilding the foremast, but as the kit part was the wrong height and I needed to add photoetch radars I went ahead and scratchbuilt it, complete with SC and SG radars in the correct positions. The Skywave Mk. 37 director got a photoetched fire control radar as well. I added a gaff for the national ensign on the aft stack, and pole masts at the bow and stern. As the ship is modeled underway, the U.S. flag is on the stack gaff, and nothing is flying at the bow or stern. 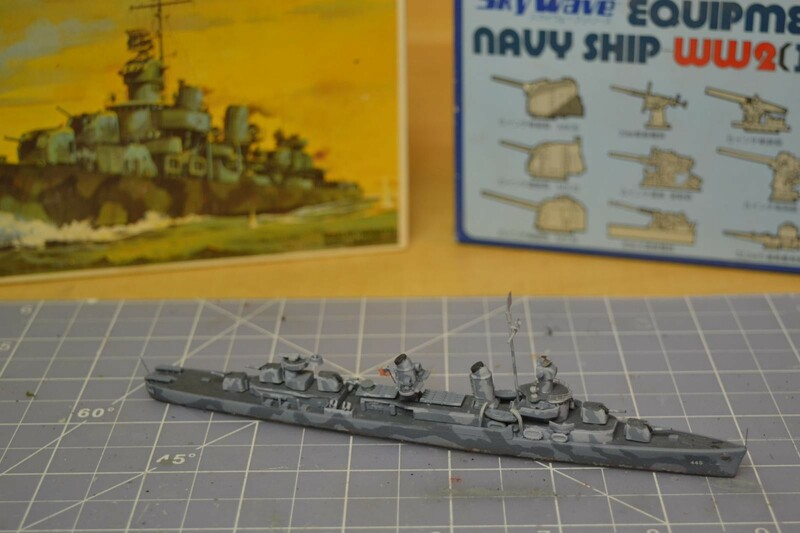 Keeping in mind that this is a poor quality 1978 Matchbox kit, I used 20mm mounts from the Hasegawa Essex kit with strip plastic shields, and scratchbuilt K-gun depth charge projectors, three to a side on the main deck aft of midships. They’re not particularly accurate, but I make exceptions for things that are smaller than an eighth of an inch. The only photoetch rail is on top of the superstructure, where I thought it added a nice detail. 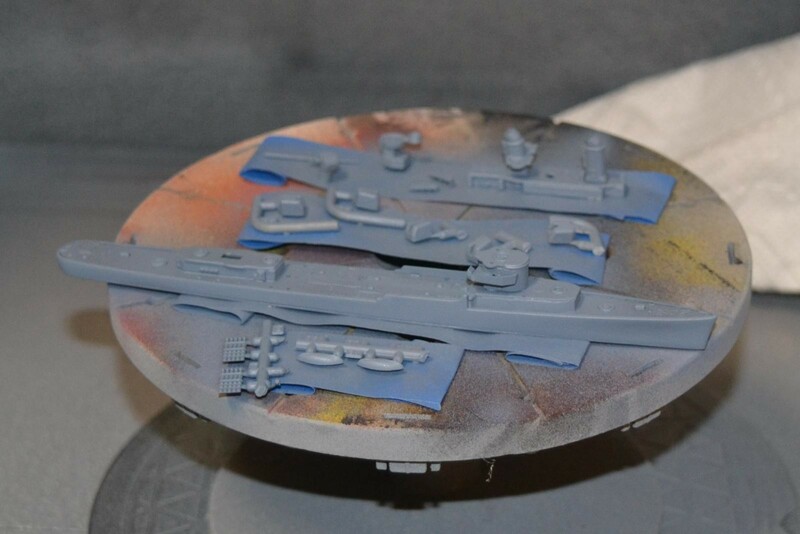 The camouflage pattern uses Navy Blue (5-N) for the lower hull color. 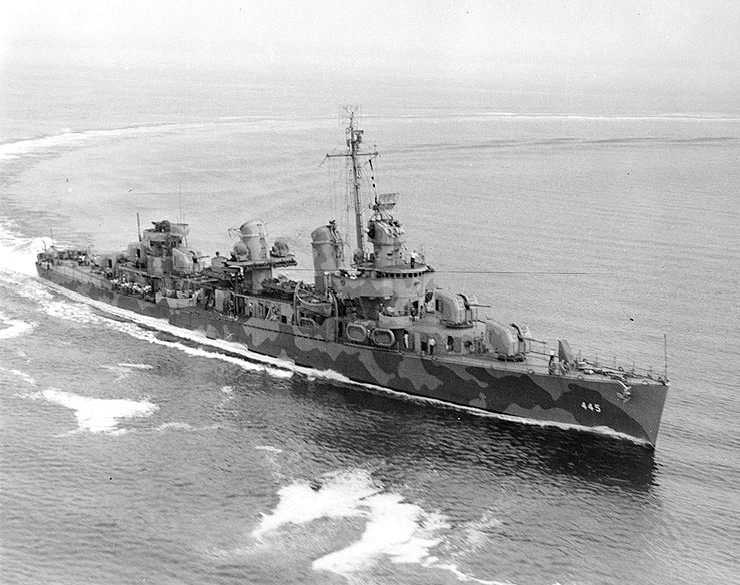 It might have been Sea Blue (5-S) but the Fletcher commissioned right around the time that color was replaced with Navy Blue, and in any event I tried Sea Blue and it was way lighter than almost any of the many photos of destroyers in late 1942, so I darkened it to Navy Blue – which is still markedly lighter and bluer than the color I had been using at the time, as shown in the “before” photo above. The lighter color used in the superstructure is Haze Gray (5-H). I added some weathering and chipping at the waterline based on a mid-1942 color photo of the similarly camouflaged destroyer Buchanan. 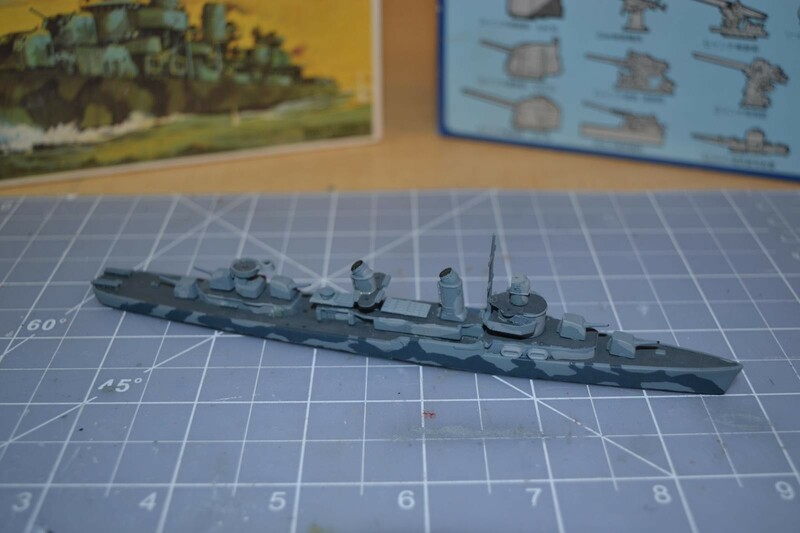 I have had a state of the art kit of the Monssen – the prewar destroyer that was next in line ahead of the Fletcher on the night of November 13, for a couple of years now, and now that I know more about that ship’s history it might be the next build. Nice build Michael, hope too see it soon on a water base. Congratulations Michael – an important class of ship – good to see this kit built up!